Asterias amurensis (northern Pacific seastar) can grow upto 50cm in diameter. It is yellow with red and purple pigmentation on its five arms, and a small central disk. Its distinctive characteristic is its upturned tips which are its identification key when compared to similar starfish. The undersides are completely yellow and arms are unevenly covered with small, jagged-edged spines (CSIRO, 2004). These spines line the groove in which the tube feet lie, and join up at the mouth in a fan-like shape (NIMPIS, 2002). In its native Japan, Solaster paxillatus (a sunstar) has been noted as a predator of Asterias amurensis (northern Pacific seastar). The predation of A. amurensis by king crabs in Alaskan aquaria has also been observed (NIMPIS, 2002). The size of prey eaten by A. amurensis usually equals the length of the seastar's arm. Organisms that compete with A. amurensis include: Uniophora granifera, Coscinasterias muricata and Odobenus rosmarus divergens (Pacific walruses) (NIMPIS, 2002). Juvenile Asterias amurensis (northern Pacific seastars) grow up to 6mm per month in the first year and continue to grow 1 - 2mm per month until maturity. The female is able to reproduce at about 12 months of age, when they are around 10cm in diameter. No valuable human use has been documented. Hunting incentives have been suggested, such as catching and drying as souvenirs of the Australian coast (Goggin, 1999). While Asterias amurensis (northern Pacific seastar) prefers waters temperatures of 7-10°C, it has adapted to warmer Australian waters of 22°C. It is typically found in shallow waters of protected coasts and is not found on reefs or in areas with high wave action. The starfish is capable of tolerating many temperatures and wide ranges of salinities. It is often found in estuaries and on mud, sand or rocky sheltered areas of intertidal zones (CSIRO, 2004). The maximum temperature for Asterias amurensis is 25°C and the minimum is 0°C (NIMPIS, 2002). The salinity range for this species is between 18.7 and 41ppt, while the maximum depth at which individuals have been found is 220m (NIMPIS, 2002). Asterias amurensis (northern Pacific seastar) reproduces sexually and asexually. Spawning occurs between July and October in Australian waters . The female seastar is capable of carrying up to 20 million eggs. Fertilisation is external and larvae remains in a planktonic stage for up to 120 days before settling and metamorphosing into juvenile starfish (NSW Department of Primary Industries, 2004). Sperm half life at 10°C > 2 hours, at 17°C < 30 minutes (NIMPIS, 2002). 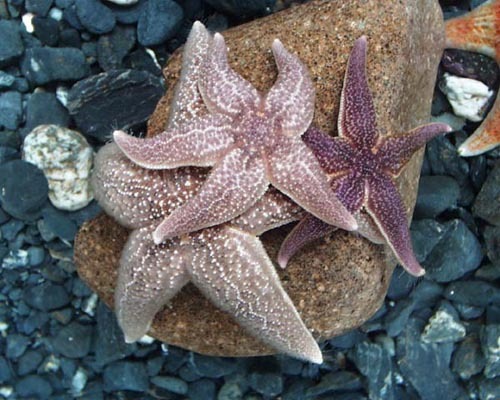 Asterias amurensis (northern Pacific seastar) eats bivalves, gastropod molluscs, barnacles, crabs, crustaceans, worms, echinoderms, ascidians, sea urchins, sea squirts and other seastars, including conspecifics if food source becomes exhausted (CSIRO, 2004). 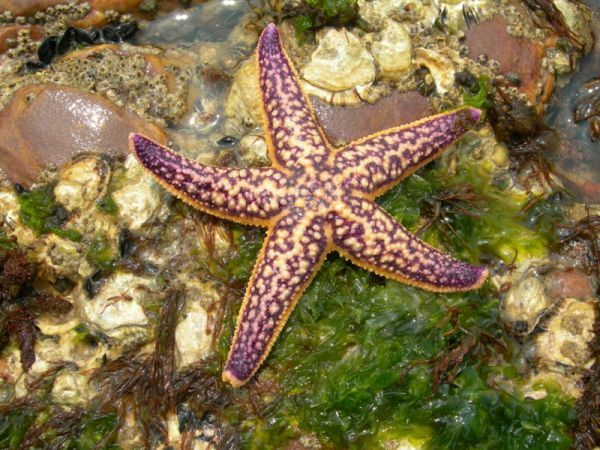 Recommended citation: Global Invasive Species Database (2019) Species profile: Asterias amurensis. Downloaded from http://www.iucngisd.org/gisd/species.php?sc=82 on 22-04-2019. Asterias amurensis (northern Pacific seastar) has the potential to establish large populations in new areas. Estimates made in Port Philip Bay (where they were first detected), indicate that numbers reached as much as 12 million individuals in two years. In their native range they are known to go through 'bust and boom' cycles reaching high abundance and then rapid decline (NSW, 2007). 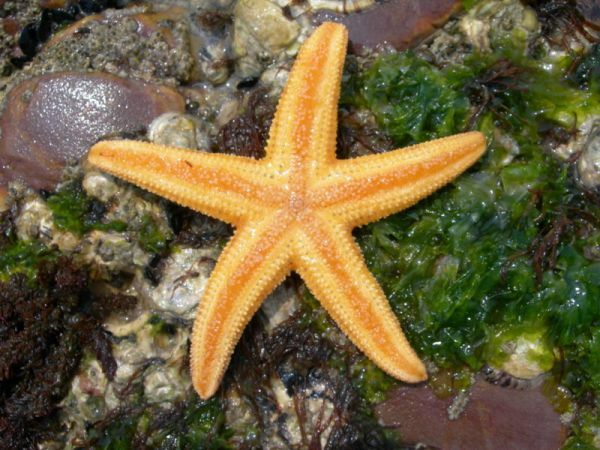 The northern Pacific seastar is a voracious feeder, preferring mussels, scallops and clams. It will eat almost anything it can find, including dead fish and fish waste (CSIRO, 2004). The seastar is considered a serious pest of native marine organisms. It is implicated in the decline of the critically endangered spotted handfish (see Brachionichthys hirsutus in IUCN Red List of Threatened Species) in Tasmania It preys on handfish egg masses, and/or on the sea squirts (ascidians) that handfish use to spawn on (NSW, 2007). The seastar is also considered a mariculture pest, settling on scallop longlines, spat bags, mussel and oyster lines and salmon cages (CSIRO, 2004). Oyster production on some marine farms in southeastern Tasmania have been affected by the seastar (NSW, 2007). In Japan seastar outbreaks cost the mariculture industry millions of dollars (NSW, 2007; NIMPIS, 2002). A two-year study was undertaken for the Department of Environment and Heritage (Australia) by the Commonwealth Scientific and Industrial Research Organisation (CSIRO) to identify and rank introduced marine species found within Australian waters and those not found within Australian waters. All of the non-native potential target species identified in this report are ranked as high, medium and low priority, based on their invasion potential and impact potential. Asterias amurensis is identified as one of the ten most damaging potential domestic target species, based on overall impact potential (economic and environmental). A hazard ranking of potential domestic target species based on invasion potential from infected to uninfected bioregions identifies Asterias amurensis as a 'medium priority species' - these species have a reasonably high impact/or invasion potential. For details on preventative measures, chemical, physical and biological control options, please see management information compiled by the ISSG. Informations on Asterias amurensis has been recorded for the following locations. Click on the name for additional informations. Summary: Over view of Introduction and reproduction methods of the Asterias amurensis. Department of Fisheries. 2000. Introduced Marine Invaders, Northern Pacific Seastar. Summary: Detailed description of habitat, reproduction, description, invasion, and eradicaton attempts. Department of the Environment and Heritage. Introduced Marine pests, National Control Plan for Northern Pacific Seastar, Implementation Workshop May 2002. Summary: Plans for Australia to implement a National Control Plan to prevent further invasion. Summary: Analysis of transmission vectors of Asterias amurensis to provide information for the formulation of a management plan. Summary: Had small section on effects of Asterias amurensis. Koehnken, L., 2001. North-east rivers environmental review: A review of Tasmanian environmental quality data to 2001. Supervising Scientist Report 168, Supervising Scientist, Darwin. Summary: Has useful information on management options for A. amurensis. New South Wales (NSW) Department of Primary Industries. 2007. Northern Pacific Seastar - Asterias amurensis. Summary: Eradication attempts and description/education about Northern Pacific Seastar. Summary: Comparison of field study conducted between Asterias amurensis and Carcinus maenus on the Tasmanian coast. Summary: This paper synthesizes work on the current and predicted impacts of an introduced predatory seastar (Asterias amurensis) on soft sediment assemblages, including native species subject to commercial fishing, in the Derwent Estuary and other areas of southeast Tasmania. Summary: A biological control agent has been found for this species. Goggin, L. 1999. Invasion of the killer seastars. Australian Broadcasting Corporation. Summary: A popular science article outlining the problems posed by A. amurensis and research that is being conducted to address this issue. Summary: Report on the invasions that have occurred at Port Phillip Bay. Summary: Report into the rate of spread by the invasive sea star.